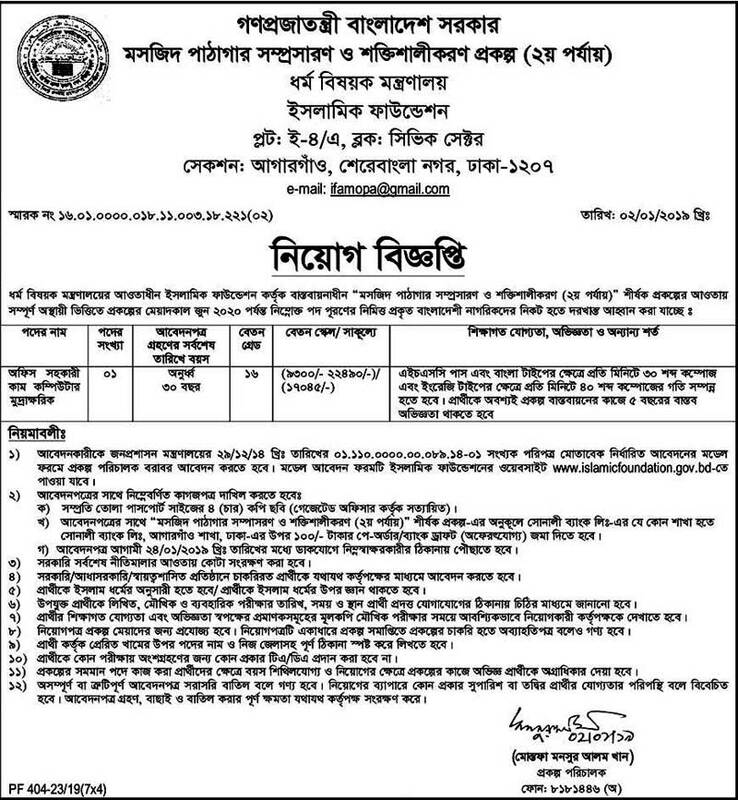 Islamic Foundation Bangladesh Job Circular 2019 has published. Islamic Foundation Bangladesh Job Circular has been published for vacant positions of Section Officer, Field Officer, Officer, Field Supervisor, and Others. Islamic Foundation Job Circular related information is available on my website. Government service is all about choosing one’s own vision; it’s more than about choosing his/her job. So eligible candidates are requested to apply for the positions. To know more details please see the original Job Circular. The last date of apply for positions 24th January 2019. Islamic Foundation Bangladesh Job Circular 2019. ■ Job Description: Islamic Foundation Jobs Circular job position is experience, talented in this department. Islamic Foundation Bangladesh only shortlisted candidates will be called for the interview as per recruitment process. Any kind of persuasion/ canvassing in any stage of the selection process shall be treated as disqualification. Islamic Foundation Bangladesh reserves the right to accept or reject any application without any reason whatsoever. Islamic Foundation Press Release: Islamic Foundation Press plays a prominent role in the successful publication, research, translation and compilation of the Islamic Foundation. Islamic Foundation is now the successful implementation of the vast publishing activities of the Department of Encyclopedia. Islamic Foundation Bangladesh Job Circular 2019. Islamic Foundation steps have been taken to provide all services to readers and researchers through Automation Program. Islamic Foundation Library, and to set up a website, all facilities are being made to reach the hands of readers and researchers from home and abroad. Islamic Foundation any user of the world can access the library service through the internet. Apart from this, interested readers and researchers have also provided photocopy services for books/book parts for the urgent need.